Kelly Rowland, award-winning singer and style icon, has been named one of this year’s new Caress® Fabulistas. The team of top beauty and style mavens will show women everywhere how fragrance can inspire them to enjoy everyday experiences in a fresh new way. Rowland is sharing how to put a fresh spin on everything from beauty to style to music and more, all to celebrate the launch of the new Caress® Fresh Body Wash Collection that brings freshness and features revitalizing fine fragrances. The new Caress® Fresh Collection body washes infuse freshness like never before with fine fragrances created by top experts at fragrance houses, Givaudan & Firmenich. The Fresh Collection features three revitalizing, fresh scents that linger on skin: Caress® Emerald Rush™ Body Wash and Beauty Bar infused with Lush Gardenia & White Tea Essence; Caress® Aqua Sparkle™ Body Wash infused with Lilac Blossom & Aquamarine Essence; Caress® Juicy Escape™ Body Wash infused with Sun Kissed Lily & Pink Grapefruit Essence. For more information on Caress® or the Caress® Fabulistas, visit www.Facebook.com/Caress. Have you spotted the new Caress Fresh Collection in stores near you? Which scent would you try? I smelled the Juicy Escape body wash the other day at Target...yummy!! See... I just went in Target yesterday and forgot to look! I will definitely be going back soon. Juicy Escape just sounds delicious! :-) Have a great weekend Ricci! Kelly Looks fabulous!! I think I might have to try lilac blossom! 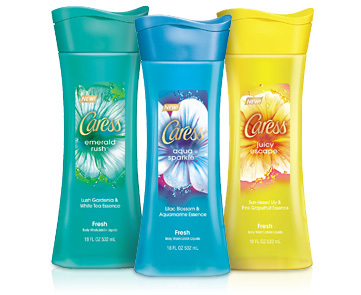 I've always loved using Caress, but I need to check out the new flavors! And I've always loved Kelly Rowland! She is always gorgeous, right? I want all three! LOL! Thanks for stopping by Rekita!